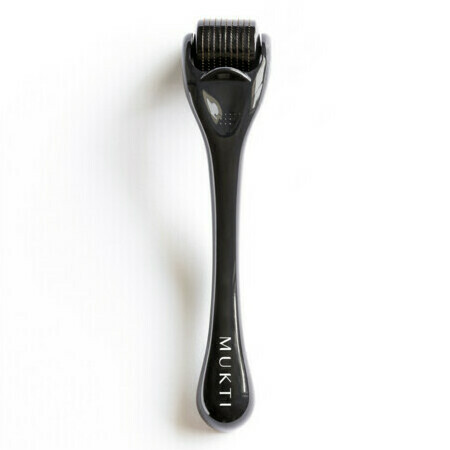 Rejuvenate and revitalise your skin with Mukti's customised Microneedle Dermal Roller which is an easy, at-home skin needling tool inspired by ancient acupuncture techniques and made from fine Titanium Alloy. The 0.25mm needles on this roller create very small micro channels on the surface of your skin which enhance the overall efficacy of your serums and moisturisers by 40%*! It achieves this by assisting the passage through to the outer dermal layer and allowing any active ingredients you apply afterwards to penetrate and reach their targeted areas. Rolling the device over your face as directed can help to rejuvenate your skin, improve your collagen and elastin production which can make your skin tighter and more youthful, thus creating a more vibrant complexion. It claims to also be effective for uneven skin tone, fine lines and wrinkles. This simple science can help to improve the performance and overall results of your skin care regime. 1. Thoroughly cleanse your skin to remove all traces of make-up and pat dry. 2. Gently roll up and down across each section of your face 3-4 times using an equal speed and light pressure. Avoid eyes and lips. 3. First roll vertically, then horizontally and then diagonally in a Union Jack pattern. Complete this on each area. (You may need to vary the pressure on the more sensitive areas of your face). 4. The treatment should take a couple of minutes and can be repeated 2-3 times a week. 5. 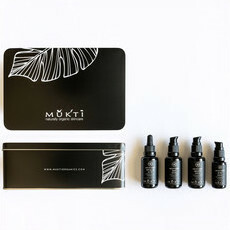 Apply appropriate Mukti serum or elixir and press onto the skin until absorbed. Products may “spike” or tingle after application. This is a normal sensation. If irritation develops, discontinue use or use less frequently. 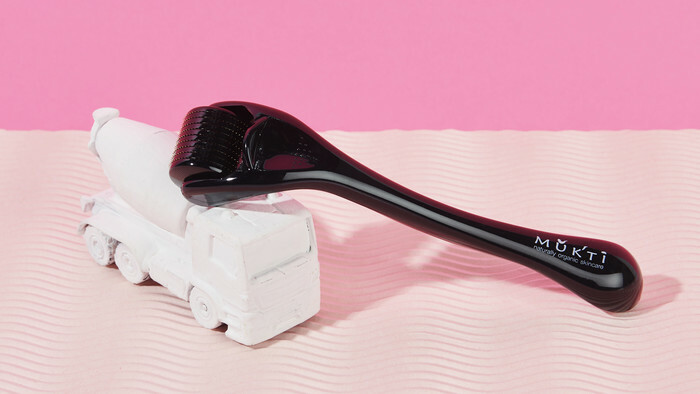 Ideally, and for optimal results, the dermal roller should be used for up to two minutes morning and night. Cleaning: Add a few drops of tea tree essential oil to a water solution and clean with a toothbrush every 3rd day. When travelling, place dermal roller in a toothbrush holder or zip lock bag. I'm new to dermal rolling and found this easy to use. I have acne scarred skin so I know this sized needle won't penetrate deep enough to solve those issues but it does really help skin texture and the absorption of products after use. I just wish I had time to use it more often during the week! This is a great product, except after a few uses my roller started to squeak. So it's a bit annoying when you use it! Cannot praise this dermaroller enough! I was new to using one and was a little skeptical and all I can say is that I am 100% converted! I love the feeling of this on my skin and my mature age skin has definitely improved. I sometimes only use it once a week but it definitely helps my serums absorb faster and gives my skin a beautiful glow!